There was a packed room at PSTA last Friday at the TMA meeting where Jacobs Engineering presented a draft of their regional Bus Rapid Transit (BRT) proposal to TMA members. The TMA members represent the MPO's from Hillsborough, Pinellas and Pasco but normally also includes FDOT, TBARTA, HART and PSTA - quite a power broker group. Background: FDOT handed HART $1.5 million in 2016 and said have at it - go hire another consultant for another transit study campaign. The contract awarded Jacobs, thru an RFP in the fall of 2016, required the end game deliverable be a project(s) that can meet criteria to enter the federal funding spigot pipeline - which also requires having a long term committed local funding source....that does not exist today. The Jacobs contract was doled out before the 2016 election when the expectation was the federal transit gravy train money aka DEBT dollars will continue as it has in the past. Hmmm...That may now be questionable. At Friday's dog and pony show, Jacobs admitted in public, that proposed rail projects in Tampa Bay cannot meet minimum federal criteria required to pursue federal funding. They admitted rail costs too much and does too little. Sound familiar? We know it and taxpayers and voters know it too. It didn't take spending $1.5 million of taxpayer money to figure it out. It is basic 3rd grade math and common sense. Jacobs admitted what we've been saying for years. The 2010 Moving Hillsborough Forward rail tax, the 2014 Greenlight Pinellas rail tax and the 2016 crony Go Hillsborough debacle were all costly, flawed bad plans. The rail projects in those plans would not qualify for federal funding. Jacobs wasted an entire year and gobs of taxpayer money because they started with the same flawed approach used before. 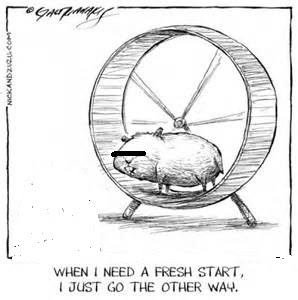 Jacobs started with a blank slate and a phony public opinion drive when they knew upfront the end result had to be a project(s) that met federal criteria to try to compete for federal funds. Suddenly this past November Jacobs decided to use what they call a "value engineering" approach and work backwards from the (mostly cost/ridership) criteria required to get federal funding. In other words, use reverse engineering. They knew what the end result must be so they simply worked backwards. Why didn't Jacobs start with that approach? How much time, resources and taxpayer money was wasted on phony meetings and meaningless presentations? To qualify for federal funding, Jacobs stated the cost per trip must be in the $8-10 range. They then had to figure out what could pigeon hole backwards into that cost range. It was not going to be rail. Finally having cost consciousness about transit projects is refreshing and certainly appreciated. But what transportation problem is this latest $1.5 million transit campaign solving? We await that answer. Remember the 2014 AEComm report? That report also confirmed that rail costs too much, does too little and we do not have the ridership to get federal funding for expensive trains. Hillsborough County Administrator Mike Merrill refused to publicly present the report to the Transportation Policy Leadership Group (PLG) in May 2014. He even tried to hide it by embedding it in another document. May 2014 was precisely the time when all the behind the scenes maneuvering was being orchestrated to hand a $1.3 million taxpayer funded crony no bid contract to Parsons Brinckerhoff and Beth Leytham in August 2014 - to fund the Go Hillsborough tax hike campaign for rail. Fortunately, they got caught and Go Hillsborough was shut down. But the local rail cartel is like a cat with nine lives. They are still alive and well, including their local media enabler, who had to immediately pounce after Jacobs proposed BRT not costly rail. Even as Jacobs admits rail costs too much and does too little, the Times publishes a very poorly written editorial Editorial: Too soon for Tampa Bay to settle for buses over light rail. This whiny opinion piece circles the drain with false rhetoric while slightly relenting the truth. But in cementing BRT as its first priority, the recommendation effectively sidelines light rail — despite rail’s standing for years as the most desirable transit option, its potential to spark redevelopment and create jobs and its earlier top ranking. Outdated, 19th century costly light rail is desirable to crony special interests and developers who will greatly benefit but certainly not by those who will have to pay for it. Rail is not desired by voters who have overwhelmingly defeated rail boondoggles at the ballot box multiple times. The Times prefers to ignore the data, ignore the facts, continue trying to pound a square peg into a round hole and continue whining for costly rail. The Times either does not know basic math or chooses to ignore it. Pathetic. H/T from one of our readers and fellow blogger, Tom Rask, who recently posted some silly little "facts" the Times conveniently leaves out of their false rail narratives. 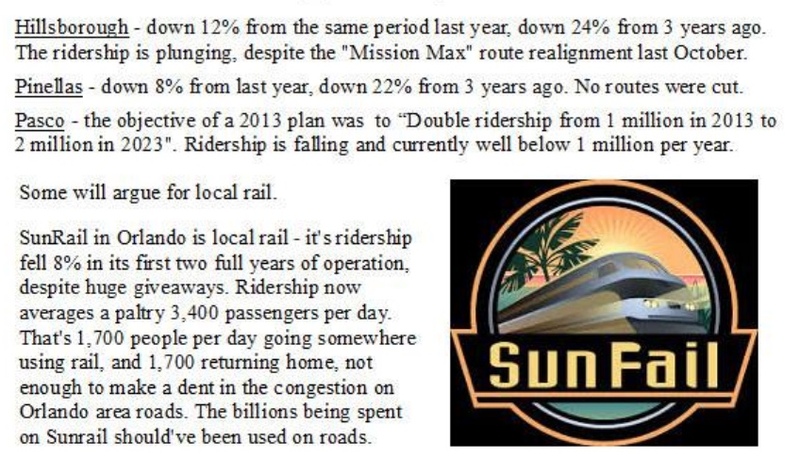 SunFail's ridership is so low that farebox only recovers 5% of its operating costs and taxpayers are forced to subsidize the other 95%. State taxpayers are also forced to bail out Tri-Rail in South Florida to the tune of tens of millions of dollars every year. The Times editorial quotes Pinellas County Commissioner Janet Long who told them she was disappointed in the shift from rail. "I think we need to keep all the options on the table," she said, "while we figure out what the needs are." Absurd! We know what our transportation needs are. We have spent mega tax bucks studying it for decades. It is not rail. Voters and taxpayers in Tampa Bay figured out years ago that rail costs too much and does too little. And pursuing costly rail at a time when traditional transit is being disrupted, transit ridership is declining and new technology and innovation is rapidly approaching is even more absurd. Yet some electeds, the local rail cartel and the whiny Times are stuck in their own hamster wheel with blinders on. They go round and round and round trying to force feed costly rail boondoggles on Tampa Bay taxpayers. Who sides with crazy losers?